I agree to my details being passed on to JERSEY SPORTS ASSOCIATION FOR THE DISABLED for them to contact me in the future, about the important work they do. JSAD is a charitable organisation and was formed nearly 30 years ago with the purpose of providing support and encouragement to local residents with a disability who wish to take part in sport. It was, and remains, the general ethos that sport should be available to all, regardless of age or disability, and be fun! 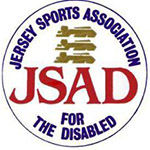 Since the early days JSAD has grown into one of Jersey’s largest sporting organisations offering a wide range of sports to all age and disability ranges. In addition to offering a sporting calendar that will keep the JSAD membership fully occupied locally throughout the year, JSAD also have a number of off island initiatives, which should enable our members to take part in appropriate competitions in the UK in wheelchair sport, special gymnastics and football. JSAD also offers sporting opportunities for physically disabled people with weekly wheelchair basketball, wheelchair tennis and wheelchair athletics sessions. JSAD are firmly of the belief that disabled sport is firstly for participation. In many cases it is a significant achievement for a disabled person to just make it to the starting line, let alone make it to the top of that person’s chosen sport. Yes, of course we make a big fuss about success, but we also do so when a personal goal is achieved, no matter how trivial this may seem to an able bodied sports person.